Keeping on the theme of making easy dinners in the crock pot, friends of mine recommended the Slow Cooker Lemon Garlic Chicken recipe from AllRecipes.com. They said that they loved it, but I was less than satisfied. I followed the recipe exactly, but the chicken turned out dry and not very flavourful. There wasn’t even much sauce to pour over the meat to relieve the dryness. I went back over the website to try and figure out where I went wrong. Well, it turns out that it’s totally possible that my friends made a completely different dish than I did! (And if so, no wonder they were raving about it, because the other version looks lovely.) If you watch the video of how to prepare the dish (which I did not), it adds a lot more ingredients that aren’t even mentioned as options in the recipe text. First of all, for spices, it adds onion powder, garlic powder, and paprika. Secondly, baby carrots, sliced mushrooms, and frozen peas are added to the crock pot before setting it up to cook. Thirdly, the 1/4 cup water and chicken bouillon is replaced with 1/2 of a cup of white wine and 2 cups of chicken broth. With all of those added flavourings and liquids, of course the dish wouldn’t end up dry and tasteless. Personally, I think that if you’re going to make a recipe video, you should stick to the recipe that goes along with it. The easy fix to this would be to add the changes to the text of the recipe. When reading a recipe, one shouldn’t have to filter through the comment section or watch a “how to” video in order to get the correct list of ingredients — neither of which are an option in a hard-copy cookbook anyway. Sadly, I think AllRecipes dropped the ball on this one. I need to defrost my freezer at some point in the near future, so I’ve been trying to use up the remaining food that I stored there for winter. At the same time, I’m trying to use my slow cooker more often in order to give myself more time to work on ComicCon costumes. 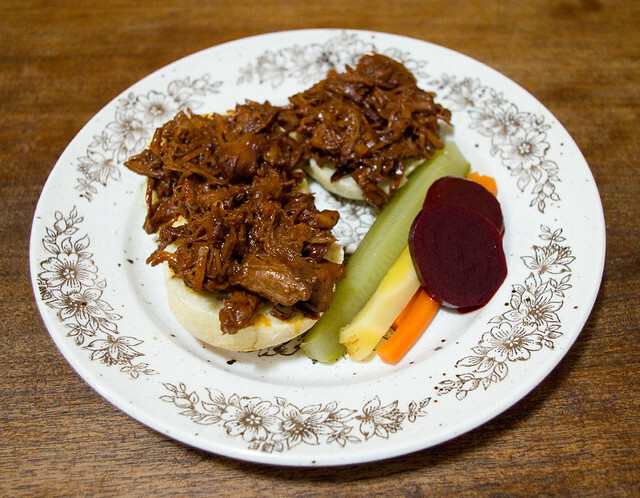 A quick Googling for recipes showed me that I had all of the ingredients to make Crock Pot Sloppy Barbecue Beef Sandwiches from The Spruce Eats, or, as my family has always called them, Sloppy Joes — which we’ve always served open-faced, I don’t know why. Instead of buns, I let my trusty bread machine do most of the work and whipped up some Bread Machine Fluffy Herb Bread, this time using dried rosemary instead of fresh dill. 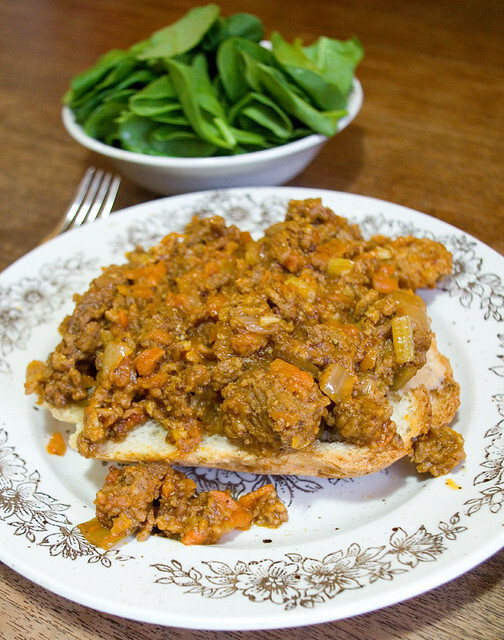 I found that the robustness of the rosemary went really well with the vinegar tang of the Sloppy Joe sauce. If you like crusty buns for this dish, the ends of the loaf are great. Or you can always use the dough setting on your bread machine, then shape the dough into rolls, proof, and bake them in the oven instead. I went the easy route on this one. As is my wont, I had to alter the meat sauce’s ingredients a bit. I omitted the sweet peppers because I’m not terribly fond of them, and I didn’t have any celery. However, I liked how the recipe had lots of hidden vegetables, so I upped the number of grated carrots to four. I also used about a cup of chopped frozen, thawed rainbow chard stems left over from last year’s garden crop. Despite all of the changes, this dish turned out really well. The kids hoovered up their dinners and kept saying how much they liked it. I really think that you could add just about any vegetable to this dish if you want, so long as you cut it up small enough that it blends well with the meat and you give it the appropriate amount of time to cook. I will definitely be making this recipe again and I highly recommend it. After complaining in my last entry that I felt like I wouldn’t have time to cook properly until all of my ComicCon costumes are complete, I took a look at the shelf of dusty appliances in the basement and vowed to let them do most of the work for me for the next month or so. I figure that my three crock pots will be getting the most use. (The bread machine never really gets put away because we use it so much anyway.) I’m starting to wish that an Instant Pot was one of the tools that I had at my disposal, but that’s a purchase that will have to wait. 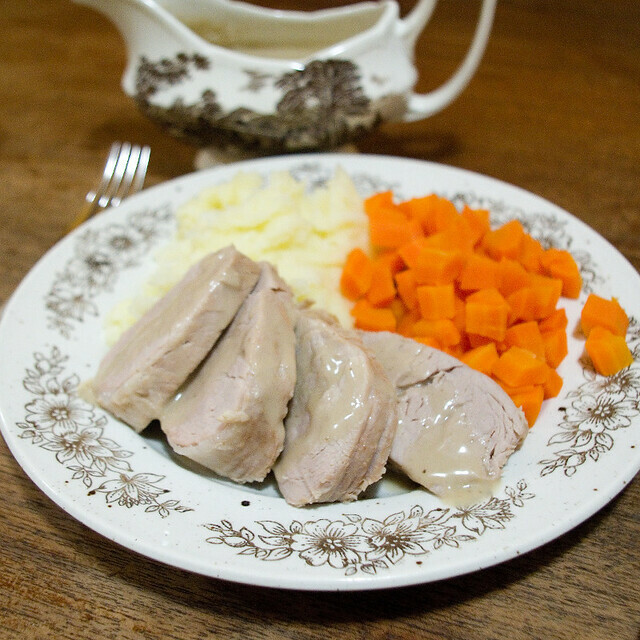 Crock pot pork loin with gravy served with mashed potatoes and steamed carrots. My friends and family have been sending me their favourite slow cooker recipes to help me along. In my experience, the ones sent to me by the friends who aren’t fond of cooking are the ones that I’ll find take the least effort and are the most foolproof. My mother (not a cooking fan) sent me the link to a Crock Pot Pork Loin with Gravy Recipe from Recipes That Crock. It’s as simple as throwing a few ingredients in a slow cooker and leaving it for about five hours. I actually had my husband do this part, and unfortunately he chose to use my 1970’s crock pot, which runs at a much lower temperature, so the dish took a good hour and a half longer than expected. 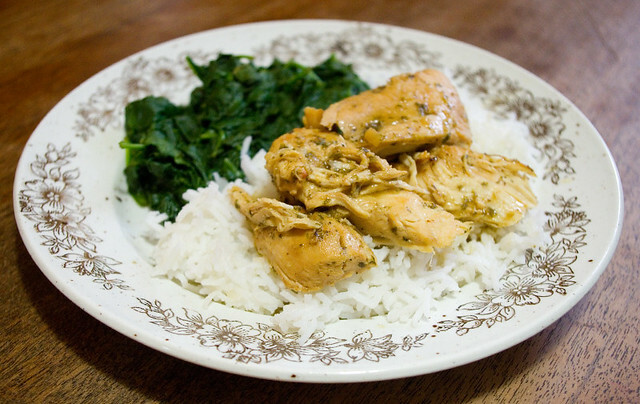 (For food safety reasons, under-cooked pork is a really bad idea.) Also, he put in too much water, so I had to thicken the gravy afterwards on the stove by boiling it down and adding a little flour. That’s also why the gravy has such a light colour. That being said, this was still a delicious meal, even with the mistakes. Basically, it’s pork chops with mushroom gravy, but with a whole lot less effort. Works for me!